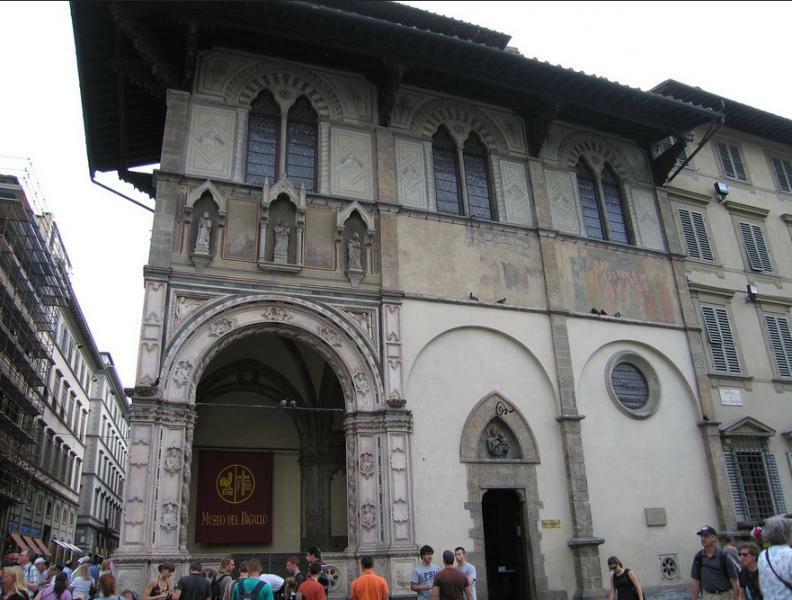 The 14th-century Loggia del Bigallo, the most striking secular building on the Piazza del Duomo, was built for one of Florence’s great charitable confraternities, the Misericordia. Founded by St Peter Martyr (the heretic-bashing Dominican Inquistor of Northern Italy, usually portrayed with an axe in his head), it was dedicated to transporting the ill, sustaining prisoners and burying paupers. He's portrayed (without axe) in a fresco on the Loggia's façade by Rossello di Jacopo Franchi, performing the Miracle of the Enraged Horse. In 1425, the building also became the seat (and took the name) of the Compagnia del Bigallo, a confraternity named after the Ospedale del Bigallo it ran at Santa Maria a Fonteviva in Chianti. The Loggia itself functioned as a lost and found office, although instead of umbrellas it dealt in children; if unclaimed after three days they were sent to foster homes. Members in the 13th and 14th centuries courageously nursed and buried victims of the plague. In more recent times, they were on the front lines, rescuing victims of the 1966 flood. Meanwhile, the Misericordia relocated in 1576 across the street. They're still there, behind the parked ambulances, where they have recently reopened their own Museo del Misericordia. Works of art donated to both charities over centuries are displayed in the diminutive but choice Museo del Bigallo. 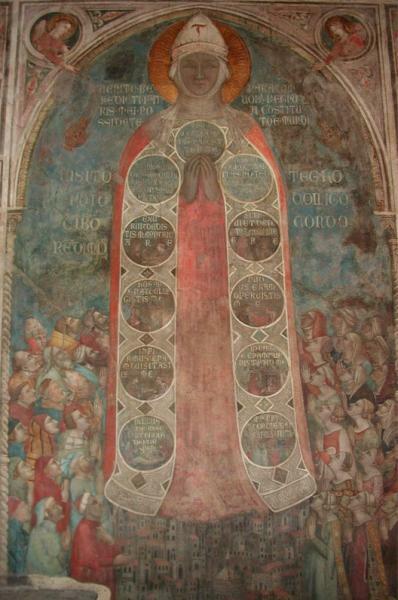 The most famous picture here is the anonymous fresco of the Madonna della Misericordia, featuring the earliest known view of Florence (1342), with the Baptistry front and centre. Unlike typical Misericordia scenes, where the Madonna spreads her cloak wide over her protectees, here she looks, perhaps appropriately, like a giant nurse, her robes adorned with scenes of the confraternity's good deeds. There's a Byzantine-style Crucifix of 1250 by the anonymous Master of Bigallo, and 14th-century golden triptych by Bernardo Daddi. Frescoes from the same century by Niccolò di Pietro Gerini (with Ambrogio di Baldese) detail the activities of the brotherhood, members of which may still be seen wearing the traditional black hoods that preserve their anonymity. There's also a pretty 15th-century Madonna and Child by Domenico di Michelino, who is best known for the fresco of Dante in the Duomo. Speaking of the poet, just east of the Loggia del Bigallo, between Via dello Studio and Via del Proconsolo, is a stone bench labelled Sasso di Dante – Dante’s Stone – where the poet would sit and take the air, observing his fellow citizens and watching the construction of the cathedral. Hours Tours every hour by appt (ring number below) 10am, 12 noon and 3pm. Sun 10am and noon.